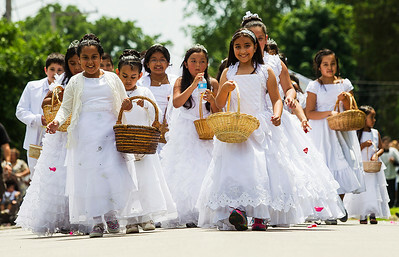 Kyle Grillot - kgrillot@shawmedia.com First Communion children drop flowers petals along Lake Street during the St. Thomas the Apostle Catholic Church Corpus Christi procession Sunday, June 22, 2014 in Crystal Lake. The ceremony includes a bilingual mass followed by the procession of the Blessed Sacrament from Lake Street to the Oak Street Church. 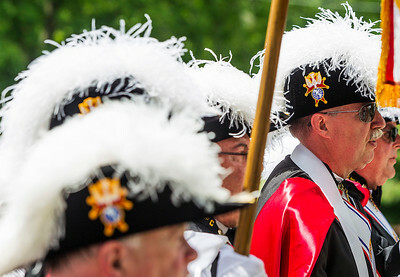 Kyle Grillot - kgrillot@shawmedia.com Members of the Knights of Columbus, including Dan O'Connell, of Crystal Lake (right), proceed down Lake Street during the St. Thomas the Apostle Catholic Church Corpus Christi procession Sunday, June 22, 2014 in Crystal Lake. The ceremony includes a bilingual mass followed by the procession of the Blessed Sacrament from Lake Street to the Oak Street Church. 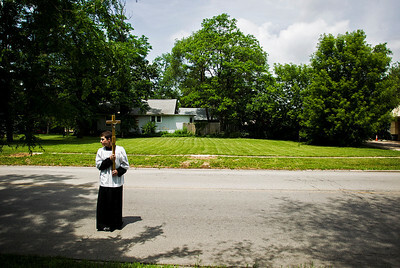 Kyle Grillot - kgrillot@shawmedia.com Altar server Jacob Tarlow, 18, of Crystal Lake carries a cross along Dole Avenue during the St. Thomas the Apostle Catholic Church Corpus Christi procession Sunday, June 22, 2014 in Crystal Lake. The ceremony includes a bilingual mass followed by the procession of the Blessed Sacrament from Lake Street to the Oak Street Church. 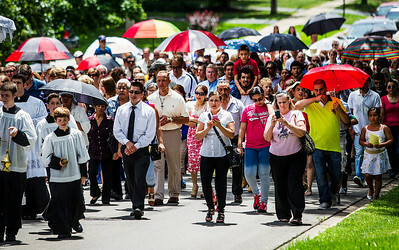 Kyle Grillot - kgrillot@shawmedia.com Parishioners walk along Dole Avenue during the St. Thomas the Apostle Catholic Church Corpus Christi procession Sunday, June 22, 2014 in Crystal Lake. The ceremony includes a bilingual mass followed by the procession of the Blessed Sacrament from Lake Street to the Oak Street Church. 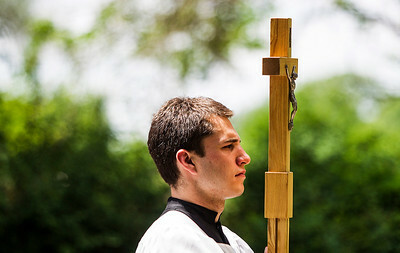 Kyle Grillot - kgrillot@shawmedia.com Altar server Jacob Tarlow, 18, of Crystal Lake carries a cross along Oak Street during the St. Thomas the Apostle Catholic Church Corpus Christi procession Sunday, June 22, 2014 in Crystal Lake. The ceremony includes a bilingual mass followed by the procession of the Blessed Sacrament from Lake Street to the Oak Street Church. 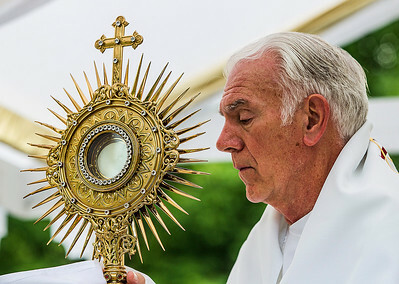 Kyle Grillot - kgrillot@shawmedia.com Monsignor Daniel Hermes lifts the Blessed Sacrament during the St. Thomas the Apostle Catholic Church Corpus Christi procession Sunday, June 22, 2014 in Crystal Lake. The ceremony includes a bilingual mass followed by the procession of the Blessed Sacrament from Lake Street to the Oak Street Church. Parishioners walk along Dole Avenue during the St. Thomas the Apostle Catholic Church Corpus Christi procession Sunday, June 22, 2014 in Crystal Lake. The ceremony includes a bilingual mass followed by the procession of the Blessed Sacrament from Lake Street to the Oak Street Church.